Our design experts can take your architectural plans, pictures, or drawings and produce a full-color, three- dimensional rendering that will show you how your structure will look with a custom Castia Stone design before construction even begins. You pay for the rendering when you receive your estimate. 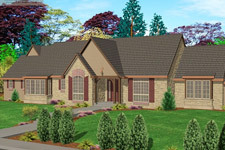 Renderings cost $475.00 for the front view and $575.00 for whole house view. Cost of the rendering will be reimbursed if Castia Stone is purchased. You will receive a project number with which you can access your rendering online. Castia Stone provides a complete 3D library of our trim pieces for users of AutoCAD 2000 or newer. For users of AutoDesk VIZ Render 4.0 or newer, there is a library of custom paterns designed specifically for our products in a range of popular colors. Castia Stone offers design tools for user's of AutoCAD version R14 or newer. These tools are in a 2D format allowing designers to represent this elegant European-style stone on their own unique projects. Included in the design tools package are the 2D trim blocks, 2D trim profiles and hatch patterns for the various Castia Stone siding options.